How to check whether role is obsolete? 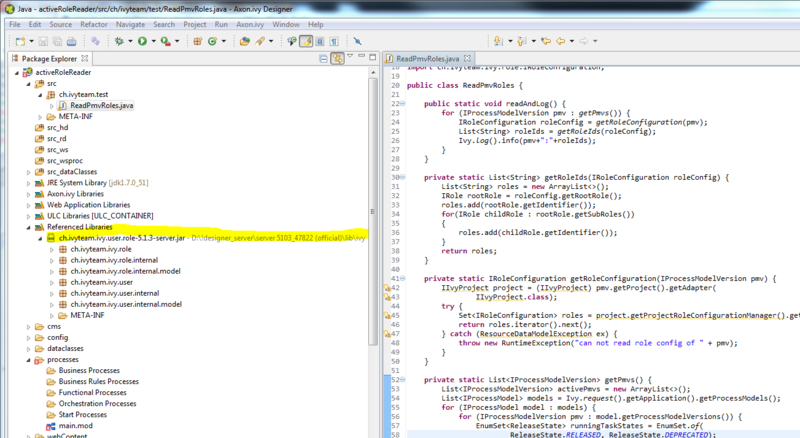 Its basically possible if you analyze the RoleConfiguration-Model of active PMVs in an application. The problem is, that the classes are not available in the designer. But you could use them if you add the jar from the engine to classpath (lib/ivy/ch.ivyteam.ivy.user.role_xxx.jar). I've wrote a sample snip which reads the already deployed role configurations of an app. Don't asume that it is 100% correct and fancy. But you get a hint which APIs that are relevant. Thanks for your suggestion. It works for us. Could you please consider to put ch.ivyteam.ivy.user.role_xxx.jar to designer classpath or provide another API in next release so that we do not need to add external jar on designer? is it possible to find IRoles by using "contains" or "like" as SQL statement?